Matt Crandell is a licensed mortgage consultant at Element Mortgage and he is here to make your home buying experience one that you will never forget. 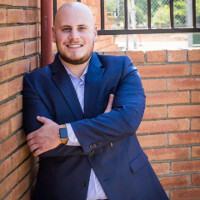 With a deep passion for helping people accomplish their dream of home ownership, Matt tailors each loan to his client’s specific needs, wants, and also long/ short term financial goals to insure the absolute best experience for each and every person. Elite communication, systems and most importantly industry knowledge all are critical elements to not just closing a loan, but doing so with minimal stress. Besides being passionate about home ownership and working a lot, Matt also likes to spend his time outdoors in the California sun. Whether it is dirt biking, golfing, hiking, fishing, or just taking the dogs out for a walk, Matt loves to be out in the fresh air. He also prides himself on his little family of 2 dogs and his life partner Raven. If you need to reach Matt, he will be doing one of these 3 things: Helping people achieve their dream of home ownership, outside being active, or sitting at home with his wonderful family so now you know where to find him! Whether you are buying your first home or not, if you are buying an investment property to improve your financial portfolio, or looking to refinance your current loan, Matt will confidently and thoroughly assist you from approval to closing. When buying the biggest purchase of your life, you want someone that is going to be caring but enthusiastic about the process. If you are looking for not just a good interest rate and deal on a mortgage, but an actual experience that will have you coming back for more, Matt is your guy. Contact him via text or email ANY TIME!